What if you simply could move your cursor to where you wanted, automatically, without your hands ever leaving the keyboard? Tobii’s eye-tracking technology sounds like magic, yet doesn’t quite live up to the promise. Keyboard shortcuts, trackpads, and thumb mice were all invented to solve one problem: how to keep your hands on your keyboard, typing away, while your focus drifts from screen to screen or icon to icon. Normally, your hand would move a mouse or trackpad to push your cursor around the screen. Tobii’s eyeX eye-tracking technology tries to cut out the middleman: It bounces near-infrared light off your retinas to produce patterns that the eyeX sensors capture and interpret. Tap a key on your keyboard, and your cursor leaps to the spot. Doesn’t that sound amazing? And if you’re one of the group of people born with eyes that the eyeX adores, then the $139 eyeX sensor is probably accurate enough to replace your mouse. It also adds Windows Hello capabilities to Windows 10 PCs, and provides an extra dimension to your PC games. But there are some gotchas, too: The eyeX’s accuracy varies from user to user, and the sensor bar works with just a single monitor. Because the eyeX also bonds to that monitor semi-permanently, it makes the eyeX a purchase that you may not be able to return. Setting up the eyeX is relatively intuitive. The eyeX is a 0.8 x 0.6 x 12.5-inch sensor bar, which connects to your computer via a short USB 3.0 cable. (If you use a USB mouse and keyboard, make sure you have enough available ports.) There’s also a small metallic mount, which the sensor bar “grabs” magnetically. 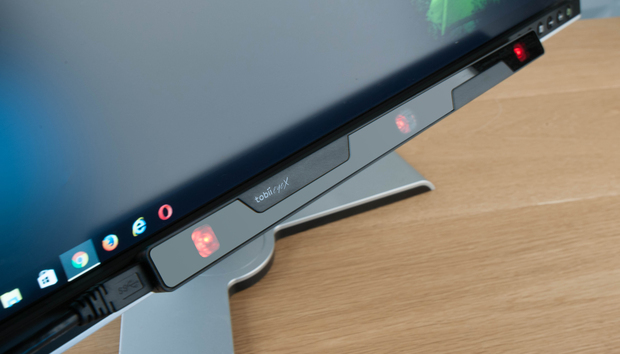 The Tobii eyeX mount blends into your monitor, but it’s also pretty much stuck there for good. That’s the first catch: On the back of the mount is an adhesive strip—more like super glue than tape, unfortunately. The backing needs to be strong enough to securely hold the 0.2-pound sensor bar, and Tobii says that, once installed, the mount will be “permanently” bonded. Fortunately, Tobii’s installation software includes an on-screen guide that helps ensure the mount is positioned properly, on widescreen monitors sized up to 27 inches. Bonding the metal strip to a desktop monitor shouldn’t affect it (unless it covers up the monitor’s controls), but I definitely wouldn’t recommend mounting the eyeX to a Surface or a laptop, where the sensor would likely block display area. Once installed, the eyeX magnetically clicks on to the mount, watching you with its three infrared eyes. It connects to your PC via a USB 3.0 cable that supplies power. Once mounted, the Windows 10-compatible software checks for any firmware updates, then guides you through a brief setup process where you’re asked to gaze at several dots in the corners of the screen. (You have the option of letting the eyeX track either eye, or both, to compensate for amblyopia or other conditions.) Tobii will also show you where it thinks your eyes are looking as part of this configuration process, giving you the first clue of how accurate the Tobii eyeX is. All of this information is saved to a profile file on your computer. Tobii’s configuration software lets you see where Tobii thinks your eyes are looking: the pink dots near the center of the screen. Don’t feel like you need to sit like a statue to use the eyeX, either; the sensor bar will track your eyes as you move around. Technically, the sensor will always track you within a 16 x 12-inch “headbox,” between 13 and 37 inches away from the screen—which, chances are, is where your head is normally. Tobii claims that you should buy the eyeX for two reasons: as a general input device for your computer, and as a gaming peripheral. We tried both. A third selling point—to add Windows Hello capabilities to your computer—was added as we began testing, and we can confirm that feature also works. You might think of the eyeX as an “eye mouse,” but there’s more to it than just that. Once calibrated, the eyeX allows you to assign a keyboard key as a mouse button, so that you can look at a spot on the screen, click the key, and—zip!— your cursor teleports there. (You can tell the eyeX to automatically “click” that spot as well, if you want.) You can also “clone” your mouse, warping it back and forth between two points—useful if you're jumping back and forth between two pages of text, perhaps. Tobii’s eyeX software streamlines some of the more common Windows tasks. Presence is also supported: You can configure the eyeX to dim your screen or lock your PC when your eyes aren’t detected, while Windows Hello will log you back in. So how accurate is the eyeX? Officially, Tobii admits it doesn’t know. But Tobii president Oscar Werner told me the eyeX is generally accurate to about 0.5 to 1 degree of arc, or about a centimeter or so of deviation on a laptop screen. The idea, he said, is that users will jump the cursor to the general area, then use the touchpad for fine-tuning—which, in my mind, partially defeats the purpose for buying it in the first place. We asked each tester to look at each successive word in red, then try to jump the cursor there using the Tobii eyeX eye tracker. The eyeX does allow for this, though. The Settings menu includes an option to warp your cursor only after you’ve moved your finger on the trackpad. This eliminates all the swipe-swipe-swipe trackpad gestures that are usually required to move the cursor from one corner of the screen to the other, and allows the trackpad to just “land” the cursor where you want. As for overall performance, your mileage really will vary. A number of variables seem to affect how accurately the eyeX performs: the size and shape of your eye, its color, as well as the size of the “target” you’re trying to hit with your gaze. Werner also said that eyeX’s research found that individuals with thick bifocals or “droopy eyelids” also have a difficult time. In my own use, with a 24-inch BenQ 1080p monitor in my home office, I found the eyeX just slightly too inaccurate to be useful. My cursor would leap to within a word or two in a block of text, rather than a specific character, forcing me to move my mouse or my thumb. I fared a bit better bouncing between the large text fields on our content management page—but again, without quite the accuracy I was hoping for. In this test, we recorded what words our testers actually “hit” when aiming for the template. I successfully navigated between tabs in my Chrome browser, though, perhaps because that was one of the few applications specifically named as compatible with the eye tracker. (I still occasionally closed tabs by accident, however.) Switching between the large ALT-TAB or Snap Assist icons via your gaze is also simple. Our Tobii eyeX accuracy template. For each circle, we asked each participant to “click” once below the line with the eyeX, then jump back to each circle, marking their “hit” with a dot marked with Microsoft Paint. This was performed ten times for each circle. I suspected my experience with the Tobii eyeX was a subjective one, however, so I asked several of my colleagues—whose eye shapes varied, and some of whom wore glasses—to test out the eyeX themselves after creating their own eyeX profile. My test was a fairly simple one. I drew a series of progressively smaller target circles on the screen using Microsoft Paint, then asked my colleagues to click back and forth across the screen, aiming for each circle ten times in a row. A second test asked them to navigate to specific words in a page of text, recording where they ended up. You can see how they fared, along with a picture of their eye, in the tables on this page. Our eyeX accuracy test results. Given that the eyeX bounces light off your eye, I suspected the eyeX would perform better when used by users with a larger target area: i.e., large eyes. The accuracy scores from a pair of female coworkers seemed to support that theory—in fact, one of them recorded just about a perfect score. But as you can see from the results, that wasn’t necessarily the case across the board. There’s really too much variation in the data for me to feel confident going beyond that one sweeping generalization, and it’s nearly impossible to say how the eyeX will work with your eyes. A game like Assassins’ Creed doesn’t require the fine control of a first-person shooter, and it was here I had my most immersive experience, navigating simply by looking at where I wanted to go. During certain scenes the camera allowed me to look where I wanted, or focus on a specific character. That's when I felt most like I was in the game. Still, most of the time playing with the eyeX felt like I was “driving” the character with my eyes, sometimes steering my character out from behind a tree by looking at the sides of the screen. Your gaze naturally tends to wander while playing a game, and normally this isn’t an issue. But with the eyeX, you can quickly find yourself wandering back and forth. That’s not a deal-breaker, though I was happy to return to the familiar mouse and keyboard. The eyeX also didn’t quite provide the control I hoped for. Some console games, like the Grand Theft Auto series, provide “aim assist,” where the game will lock on an opponent provided you move the targeting reticule in range. Such an arrangement seems tailor-made for the Tobii eyeX. In general, I feel the same way about the Tobii eyeX as I did the original Lytro camera: Tobii has crafted an intriguing concept that hasn’t quite coalesced into a worthwhile product. Even if you get past the accuracy issues, restricting the eyeX to a single monitor is a serious limitation. Perhaps a line of monitors with embedded sensors is the solution. Here’s the deal: If Tobii wants to replace a tried-and-true peripheral like the mouse, the eyeX needs to be really, really good. For everyone. Granted, Tobii is positioning the eyeX as a sort of a quasi-pointing device/gaming peripheral/Windows Hello access device—and if that’s an attractive mix, then the eyeX may be for you. In general, though, it’s a bit of a wager—eye tracking might work wonderfully with your eyes, or it might not. Tobii’s technology, though, implicitly promises a future where your gaze will replace your mouse. And as fantastic as that sounds, that future is still some ways off. « Apple's software woes: Problems or progress?